You will not find better pricing on the Internet! We supply you with the best credit card machines that the industry has to offer. If you need to accept credit cards, debit transactions, or checks you can find the best software and hardware at the cheapest prices with Merchant Service Group. Guaranteed! 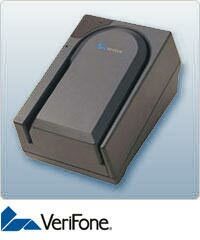 The VeriFone CR 600 Check Reader provides reliability and ease-of-use to your point of sale. The VeriFone CR600 also helps you reduce risk associated with bad checks and fraud. The VeriFone CR 1000i Check Reader converts paper checks into electronic documents. By doing so, The VeriFone CR 1000i reduces cost and risk, while making it easier to accept checks at the point of sale.